Each month we take time to answer the most commonly asked questions we get from future customers. This month we are focusing on perhaps the most important question … “What is your specialty?” It’s hard to narrow it down as we pride ourselves at being the best in the business, focusing on perfection no matter the size of the dream. But to answer your question, we can sum up our specialty in one word … CUSTOM (so much so, we have it in our name)! Every single Texas Custom Patios’ project is custom-designed and built to enhance your home perfectly and complement your personality. We are family-owned and operated with our original home office out of Stafford, Texas and our second hub in Irving, Texas. We service areas that cover greater Houston as well as Dallas and Fort Worth and surrounding areas. 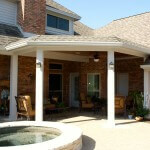 We have completed more than 1,200 custom outdoor living projects since we opened our doors in 2004. We are always so thrilled to build something that enhances the home, while looking original to the home. The additions are seamless and flawless, leaving our customers smitten with where they’re sittin’! 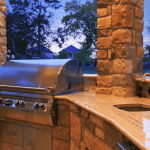 We provide turnkey design solutions for outdoor living including: patio covers, outdoor kitchens, screened porches and patios; room additions, pergolas, decks, outdoor fire features and so much more! To see some of our most praised work, check out featured projects on our Houzz page. And don’t forget our latest project of the month, here! We also update our Facebook page and Instagram daily … so visit there frequently to see the latest and greatest. Here’s a sneak peek at what you will see on our social media channels.